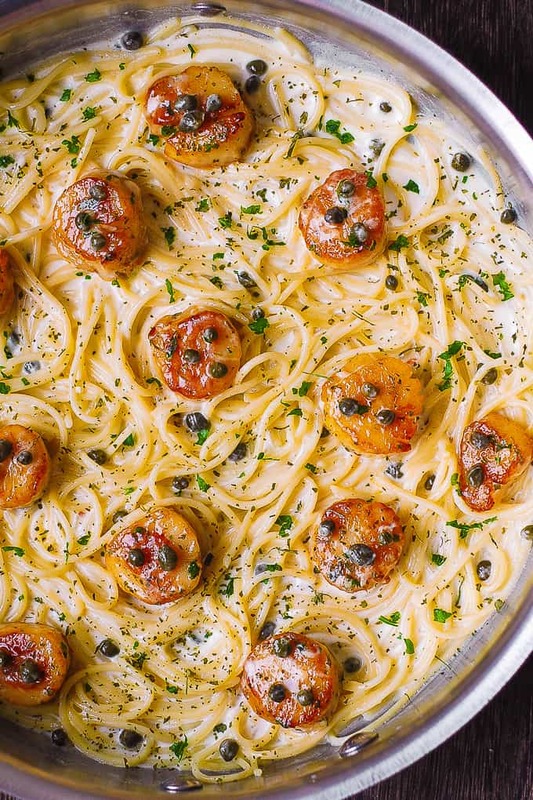 Scallop Spaghetti in Creamy White Wine Butter Garlic Sauce with Capers – a gourmet meal that’s easy to make! 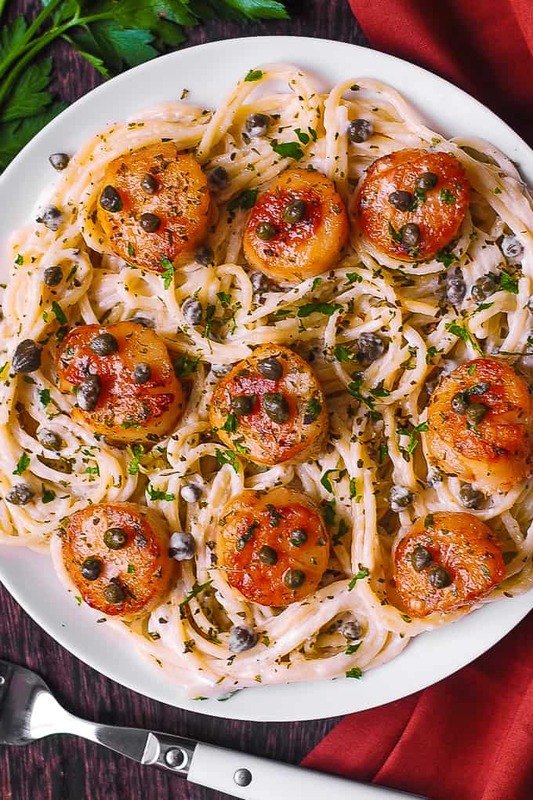 Scallops are first seared and then smothered in creamy butter garlic pasta sauce with capers. You’ll love this Italian pasta. Scallops are moist and full of flavor! Looking to introduce something new into your weeknight dinner menu? Then, make this scallop spaghetti with white wine sauce! Your family will love it! This Italian style pasta looks fancy and presentable like an entree from a gourmet restaurant. But it’s easy to make. What do scallops taste like? Scallops have a mild, buttery, almost sweet taste. What to serve with scallops? They taste amazing on their own like these seared scallops with bacon in lemon cream sauce. You can serve them roasted asparagus or green beans. Scallops are also fantastic with creamy pasta and garlic. Take a look at this delicious scallop pasta with creamy Mozzarella sauce. The simple alfredo sauce is made with white wine! Wine adds so much dimension to a regular pasta sauce. Use Chardonnay, Pinot Grigio, or Sauvignon Blanc. The scallops and pasta absorb the creamy white wine sauce with garlic. You get the creamy deliciousness with every bite! 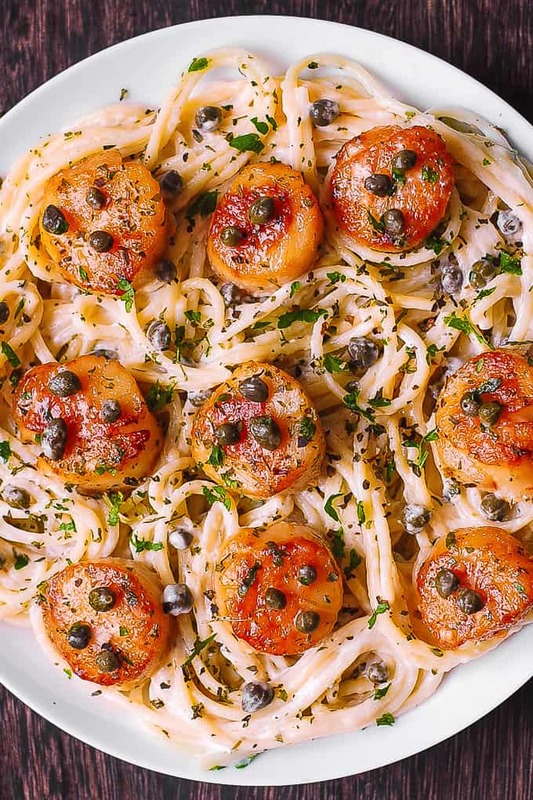 You will love the addition of capers to the creamy pasta sauce. Scallops are pan-seared in the skillet with olive oil until crispy. They acquire a beautiful golden crust that will make your dinner look very gourmet and appetizing. Pan-seared scallops and pasta are then combined with easy-to-make white wine garlic sauce. Because the sauce uses butter, Parmesan cheese, and heavy cream, you can call this dish scallop pasta alfredo. Creamy white wine butter garlic sauce also features capers. They provide a sharp and salty taste to the scallops and pasta. Because the scallops are smothered in a creamy sauce, they are moist and flavorful. You don’t have to worry about overcooked scallops when you combine them with creamy pasta. White wine butter garlic sauce will make scallops taste creamy and soft. What’s great about scallop pasta recipes is that you don’t have to worry about a side dish. You get a complete meal in a single dinner. 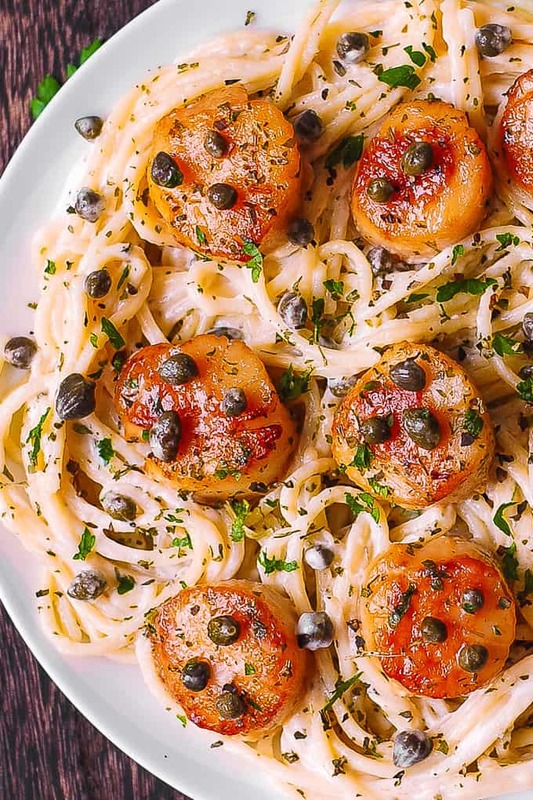 The scallop pasta in white wine sauce with capers looks very gourmet, but it’s easy to make. Use sea scallops. They are big size scallops that are usually about 1.5 to 2 inches in diameter. Because of their large size, sea scallops are easy to sear. Using them will make it easy to get that nice golden crust on your scallops. Thaw frozen scallops in the fridge overnight. Do not use a microwave oven. Don’t thaw on the kitchen counter. After thawing and right before cooking, pat dry scallops with paper towels. First, cook butter, olive oil, and minced garlic on medium heat for about 1 minute, until garlic softens. Then add white wine and bring to boil. Boil for several minutes until the wine reduces in half. Next, add heavy cream and Parmesan cheese. Simmer and stir for several minutes until the sauce thickens. Stir in drained capers and freshly squeezed lemon juice. Season with salt and pepper. Use a large skillet. This will give you more surface for searing more scallops. It’s important not to overcrowd scallops. If you use a small or medium-size skillet, you might have to sear scallops in 2 batches. Use a stainless steel skillet or cast iron skillet. These skillets work best for searing and creating a golden crust. Make sure the scallops are completely thawed. Pat dry scallops with paper towels. Use any type of pasta with long strands. Use spaghetti, fettuccine, pappardelle, or linguine pasta. To make creamy alfredo sauce you can use any of these cheeses: Parmesan, Mozzarella, Pecorino Romano, or Asiago. 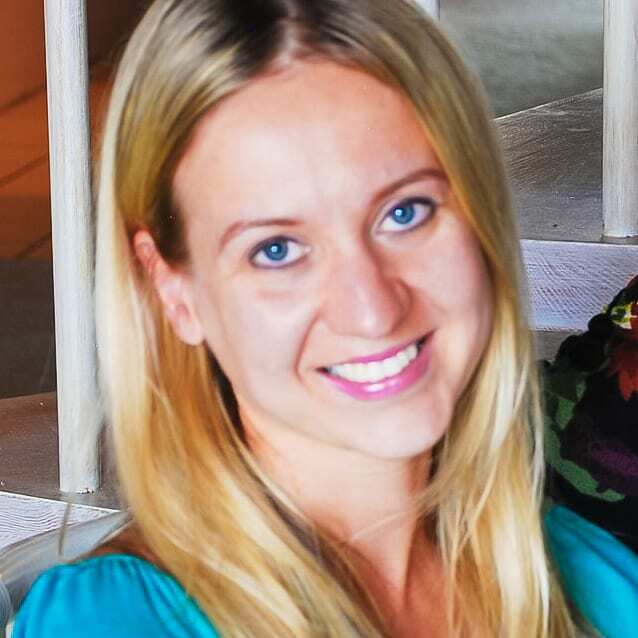 Best wines to use for white wine sauce: Chardonnay, Sauvignon Blanc, Pinot Grigio. 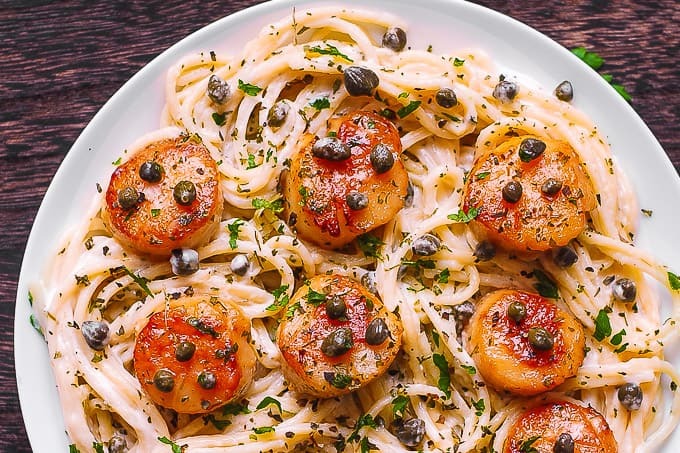 Scallop Spaghetti in White Wine Butter Garlic Sauce with Capers is a gourmet meal that you can easily make at home. Scallops in white wine butter sauce are moist and full of flavor! Pasta with creamy garlic sauce works great with scallops! In a medium skillet, heat butter, olive oil and minced garlic on medium heat. Cook for about a minute, until garlic softens. Add wine. Bring to boil. Boil for several minutes until the amount of wine reduces approximately to half. Add heavy cream and Parmesan cheese. Bring to boil, and immediately reduce to simmer. Simmer for a couple of minutes, stirring at all times, until the sauce thickens a bit. Remove from heat. Stir in drained capers and freshly squeezed lemon juice. Season with salt and pepper. Taste, add more lemon juice, salt and and pepper if needed. Keep covered. Cook spaghetti according to package instructions until al dente. Drain. Add to the sauce, stir to combine. If using frozen scallops, make sure the scallops are thawed completely. Blot each scallop with paper towels to remove extra water. Heat 2 tablespoons olive oil in a large skillet on high heat until hot but not smoking. Oil should not be smoking, just rolling easily around the skillet. Add scallops without overcrowding the pan. Sear on one side for about 4 minutes until the scallops are a golden color. Don't move the scallops around the pan in the beginning. Turn the scallops to the other side and cook for 2 or 3 more minutes. Remove from heat and transfer the scallops to the plate immediately. Don't allow the scallops rest in the hot skillet, off heat. That will make them steam and lose their crust. Add cooked scallops to the spaghetti with the creamy white wine sauce and reheat gently. Serve.